After the trade seemed to have no chance, talks have revived between the Cavs and Lakers. 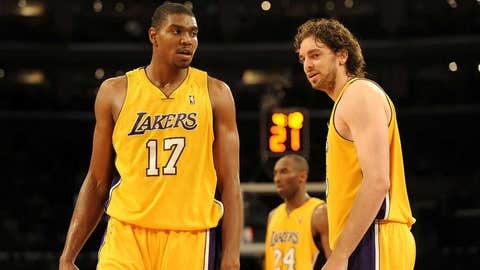 Talks between the Cleveland Cavaliers and Los Angeles Lakers about a trade involving center Andrew Bynum and big man Pau Gasol have been rekindled and are moving forward, multiple sources told FOX Sports Ohio on Saturday. The teams began discussing a deal last week, but things hit a snag when the Cavs felt that the Lakers were asking for too much in return, sources said. According to sources, the Lakers are highly interested in obtaining the contract belonging to Bynum, suspended and then exiled from the Cavs for conduct detrimental to the team. The Lakers are willing to part with Gasol, provided the Cavs include an additional player or draft pick (or both), sources said. Should the Lakers obtain Bynum, it is widely believed they would immediately waive him. Bynum is due $12.25 million this season, but only half of that if the Cavs waive or trade him by Tuesday. ESPN has reported the Cavs are hopeful of pulling off a deal Sunday, as it takes 48 hours for players to complete a physical and a trade to be finalized. Along with the Lakers, the Cavs have had discussions with multiple teams about a potential Bynum deal, sources said. Should the Cavs provide an asset in addition to Bynum, the Lakers would be willing to move quickly, sources said — adding that the Lakers are sensitive to players with long-term contracts, as they desperately want to protect future cap space. More specifically, in addition to Bynum, the Lakers are believed to be seeking a deal that would expire within the next year or two, or in the "Kobe window" — when star guard Kobe Bryant’s two-year contract expires, sources indicated. Cavs guards Dion Waiters and C.J. Miles, forward Earl Clark and forward/center Anderson Varejao all have deals that fit such a timeframe. Bynum, 26, played in 24 games for the Cavs (19 starts) after missing all of last season with the Philadelphia 76ers with injuries to both knee. He’s averaged 8.4 points and 5.3 rebounds with Cleveland. Gasol, 33, is averaging 15.3 points and 9.5 rebounds. Trading Gasol’s expiring $19-million contract, and waiving Bynum, would assist the Lakers in avoiding hefty tax-related fines under the NBA’s salary cap.